Here's an amazing story. A young child writing to a popular television programme with wild claims and, quite frankly, ridiculous aspirations. He was treated in all seriousness and given a measured and sensible reply, and who knew what will happen. Well, in this case we can see what happened. The lesson is clear: Just because someone has unbelievably ambitious expectations, always take them seriously. You have no idea what they can achieve provided no one gets in their way. I need to learn this. I am too quick to judge, too quick to criticise, and way too quick to point out why something won't work. I'll remember this for a long time. Nine-year-old Anthony Hollander to Blue Peter, 29 June 1973. A list of what I need. 4. Tools for cutting people open. 6. Fiberglass box, 8 foot tall, 3 foot width. 7. Picture of a man showing all the arteries. Sorry, but in number 6 in the list the box needs lid. If you do get them on 1st March I can pay £10, £11, £12, £13 or £14. Love from Anthony Peter Hollander. 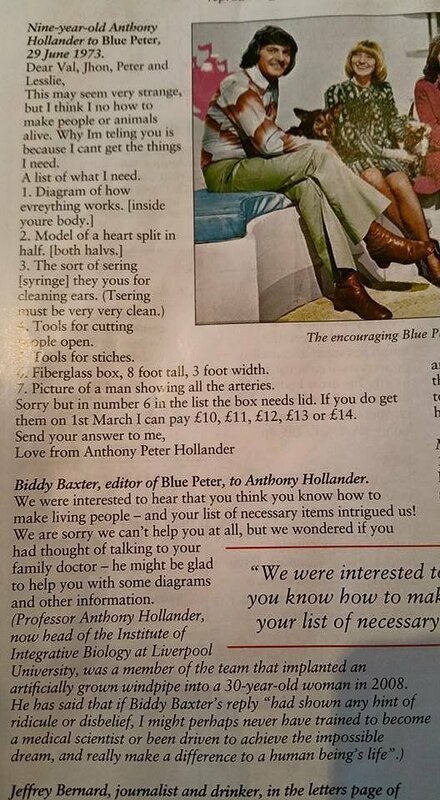 Biddy Baxter, editor of Blue Peter, to Anthony Hollander. We were interested to hear that you think you know how to make living people -- and your list of necessary items intrigued us! We are sorry we can't help you at all, but we wondered if you had thought of talking to your family doctor -- he might be able to help you with some diagrams and other information.